Barbati is located near Pantokratorasmountain and offers a marvelous view over Corfu old town, the Venetian fortress and the far Albanian mountains. Barbati is placed in a part of the coast that is rich of lovely bays and hidden caves and has a beautiful white stones beach. 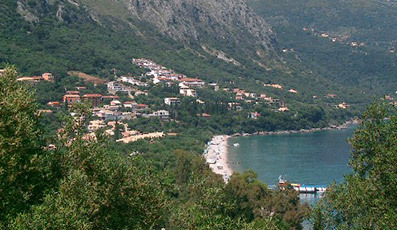 This village can offer the tourists both the sea and the mountain and it has been developed into two different areas. One is higher along the coast road, is more chaotic with its bars and shops. The second part of Barbati is more tranquil, is surrounded by olive trees and in order to reach it you have to follow the unpaved roads that from the coastal road bring to the sea. 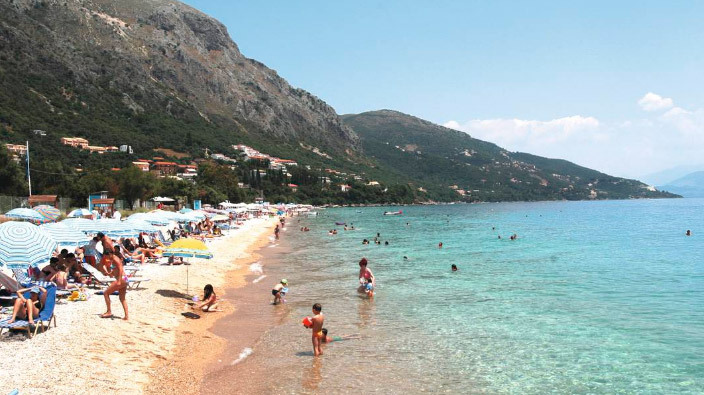 This is one of the several beaches in Corfu island rewarded with the Blue Flag by the European Community for the cleanness of its sea water. To reach the beach you need to follow the streets that from the coastal road will take you down to the sea. Just behind the beach there’s a nice green area where you can relax under olive trees shadow. Barbati is connected to Corfu town by the local daily bus service. There is also a taxi boat service that permits you to reach Ipsos and the near bay of Nisaki. There are not so many shops in Barbati, but it doesn’t lack of supermarket or tourist shops. For a good meal there are several local restaurants near the sea. Barbati does not offer a great night life, it is the ideal place for those who search a calm place without renouncing to a cocktail in the evening. Nikolas tavern is a traditional Greek restaurant open both for lunch and dinner that will permit you to taste local recipes of meat and fresh fish in a friendly and charming atmosphere. Barbati is a small village of Corfu island that offers some accommodation like family hotels or apartments both along the beach and the coastal road.